Sometimes Grandpa Joe doesn’t have to come over to get your computer back to working like you want it to. For many kinds of issues, I can work on your computer right from my desk! I can monitor and maintain/update your computer by accessing it through the Internet. After installing a free Web application called LogMeIn, I can see problems just like I was there in person. I can assess the condition of your computer, printer and other components, scan for infections or malware and clean or correct problems I find. Remote support is easy, safe, and convenient. One valuable benefit of remote support is that I can watch what is done when a problem comes up while we discuss it over the phone. Sometimes by observing, I can spot a problem and quickly determine what could be causing it. I can perform the corrective work while you watch and we can immediately tell if the problem has been solved. Also, I’ll have a complete idea of all steps taken and what, if any, steps you should take in the future to keep things working well. Preventive maintenance is especially easy with remote support. 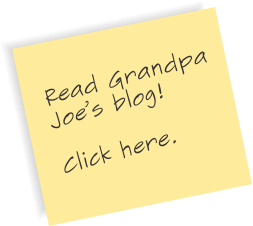 By catching little issues before they become large problems, Grandpa Joe can keep your computer ready for the tasks you need it for, and can lessen the chances that expensive and inconvenient loss of use might happen. This is my minimum charge. Additional time will be billed at $49.00 per hour in quarter hour increments. Ohio sales tax will be added to all receipts. All parts and software will be billed at cost if purchased online. Parts and software purchased locally will have a 25% surcharge added. I accept cash, check and PayPal (credit cards through PayPal are also accepted). If the original problem recurs within two weeks of my visit, I will return and fix the re-emerged problem at no additional charge. See Terms and Conditions. LogMeIn is neccessary for remote support and preventive maintenance. Clicking the LogMeIn logo above sends you to get the free LogMeIn Web application. This easy to install app will allow me to do Remote Support on your computer. You will choose a login name and password as part of the installation. Control your remote computer over the Web as if you were sitting right in front of it. Secured with 256-bit SSL encryption for all connections. 100% free. Remote support service rate is $59.00 for the first hour.